The weather in Dallas, Texas is quite unpredictable so finding a durable floor coating that could be installed in varying temperatures can be quite challenging. Although epoxy is a very hard material perfect for use on garage floors, it is very temperature-sensitive. 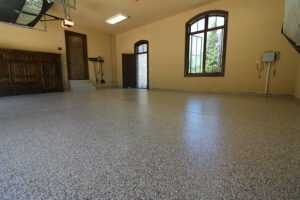 As an alternative to epoxy floors, polyurea polyaspartic coating became a highly recommended option. It can be installed in any weather and it cures to a perfectly tough surface regardless of temperature. Aside from garages, this can also be used to resurface basement floors and commercial flooring. Polyurea polyaspartic is impact and stain-resistant. It does not discolor or peel when it comes in contact with moisture or even chemicals. It stays hard and firm even when hot tires sit on it. This coating is easy to clean. It does not require any special product or process to maintain its good looks and durability. It is eligible for use on both indoor and outdoor floors and it can be installed no matter how cold or warm the climate is. Polyurea polyaspartic does not discolor, deform, or crack despite being exposed to ultraviolet rays. It can withstand the heat of the sun perfectly. This coating can be customized with paint chips in one or multiple colors. The chips are broadcasted onto the coating, creating a terrazzo-like effect. One of the most noteworthy trait of polyurea polyaspartic is its quick-dry feature. It only takes a day for it to install and cure. This is a perfect solution for urgent projects. Looking for a hard-wearing epoxy alternative garage floor? Call (972) 885-6067 today! It is tough to find that rare combination of sturdiness, durability, and aesthetics, especially on a garage floor. But with polyurea polyaspartic coatings, it is possible! Dallas Concrete Surfaces aims to let floor owners experience the wondrous features that this ultra-tough material can bring. We have more than three decades of experience, skill, and knowledge in the decorative concrete industry and we make sure that it is reflected on every floor we work on. Still looking for a tough coating for you floor? Search no more. Call us and let’s talk about polyurea polyaspartic.